I'm starting a new class of "dormet" (dorm gourmet) recipes that cater to college kids and military dorm rats (of which I was one for several years). These recipes will use common simple ingredients, brain-dead easy preparation, and microwave cooking. The goal is to produce near-restaurant-quality dishes with minimal expense and effort. It may be shocking, but dorm rats are generally poor and lazy. I can't believe that it has taken me this long to start posting recipes like this. When I lived in the Air Force barracks I used to recreate all kinds of home-style dishes in a microwave. I even had a microwave pressure cooker that was invaluable. People thought I was nuts, but the results spoke for themselves. Hey guys, it's also a great way to impress the ladies *wink*. I'll have to scour the house to see if I can find some of those old-school recipes. 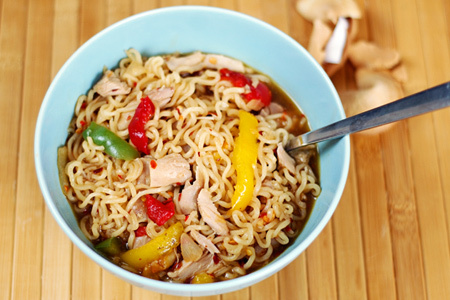 Enough yakking, let's get dormet with these crazy simple spicy chicken noodles. Break the brick of noodles into four pieces and put them in a medium bowl. Add the stock, soy sauce and red pepper to the bowl. Cover the bowl with plastic wrap and poke a small hole in the center. Microwave for three minutes. Remove the skin from the chicken, pull the meat from the bone and cut into small pieces using a spoon. Discard the skin and bone. Uncover the bowl, stir the noodles to help break them up, add the remaining ingredients and stir to combine. Microwave, uncovered, for two minutes. Stir well and let stand five minutes. Save all leftover condiment packets. They are a great source of free ingredients. 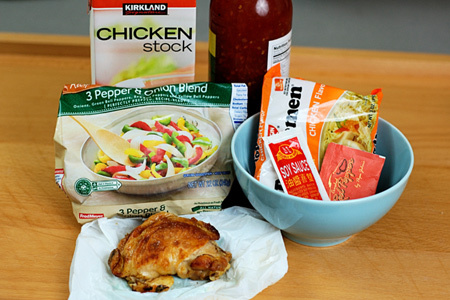 For example, two of those little plastic tubs of fast food sweet & sour sauce will suffice for this recipe. The chili sauce is dirt cheap (about $4.50 for 24 ounces), tastes much better than fast food sweet & sour sauce, and keeps almost forever in the fridge. You can make a shrimp variation of this recipe by substituting bay shrimp for the chicken. No red pepper? Use a few dashes of hot sauce. Great recipe. I was in the grocery store yesterday and you can buy the same ramen noodles in large package. Thanks for the recipe. Great idea. That certainly isn't plain ol' packaged ramen! Creative work, John. this looks positively delish! I'm a working mom and many times and left with little time to cook, let alone plan ahead! I guess at times, I can be a "dorm rat" too.